As the ultimate leave-behind marketing tool, it’s important to assess the types of cards you can purchase before diving into what it will look like or the information it will feature. Keep in mind that the best business card will also reflect your industry. If, for example, you’re an auto mechanic, going with a formal business card probably won’t hit the mark. Conversely, if your market is sophisticated, don’t choose a casual design. The best business card doesn’t have to be complex or expensive. In fact, in some cases, going with a simple, all-white card may be the best way to go. In this way, you can highlight a few pieces of information (such as your business’ name, address and website) in black font. This basic type of card might be a good starter for your business, when you’re not sure if you’re ready to invest a few more dollars into a more eye-catching design or you haven’t settled on a physical location and your contact information isn’t yet set in stone. The next step up in business card development is to include an image on the marketing piece. The image could consist of your own picture, a wise move if you are part of the branding and the card isn’t for a corporate entity or big brand. Other images that work include those that represent the brand (such as musical instrument for a piano tuner, or a tool for a repair service provider). Make sure the image conveys what you’d like it to and that it connects to the function of the business. In many cases, a business card’s picture better represents what you do than any amount of words. Business cards with words and images appeal to a few ways of receiving information. Namely, people will “see” the image and “read” the text. But what if you could include another sense to catch their attention? It’s possible to purchase business cards that have a tactile appeal, too. Make sure this aspect connects as much as it can to your brand. One of the best ways of the ways to appeal to the sense of touch is to design a card from a material other than paper – such as plastic, wood, or metal. Thickness can play a part too, using a heavy card-stock will add some weight to your card in the recipient’s hands, as well as help it stand out from the bunch. Another technique is to add colored edges to your business card, or use textured paper. In addition, you can veer from the standard rectangular shape, and construct a card that’s square, round, or folded. It’s also possible to design a card with special materials embossed into the its surface. While a clever design can go a long way, sometimes the best way to go when creating a business card involves using “smart” messaging. You can only put so much text and an image or two on the actual card – even if you’re using both sides of it. But with a Smart Business Card™, you can do so much more. Here’s how they work: The card itself features an innovative design that essentially hides the USB inside of it. Over half of the card follows traditional business card formatting, with an image, logo, and contact information. But then the perforated card allows recipients to remove one side of the business card, which hides a USB. Once the USB is sectioned off, it can be plugged into a computer where the recipient can access a whole other world of promotional materials. When the USB launches on the computer, you can choose the information users will see. The technology can Consider direct users to a special landing page or promotional page that provides product education, un-boxing instructions, or product features. The sky is really the limit with the auto-launched programming. Selecting the type of business card to use is just the first step. Once you’ve landed on the card that will best suit your purposes, it’s time to focus on quantity, finish and so forth. Work with a reputable service provider who not only helps you choose the right type of card, but can also professionally design the card so that it accurately represents your brand. There’s nothing worse that investing money in a clever business card, only for the final product to disappoint. Clashing colors, minuscule text, nonsensical images – these are just some of the factors that can degrade the quality of your card and make you want to keep them in your pocket – instead of handing them out. The next time a trade show comes around, you’re hitting a networking event or you’re giving an elevator pitch, ensure that you’re confident in your business card and that it will represent you well. Get inspiration from some of the best business cards around, and work with a trusted designer. Your card should include critical details like your business name, logo or tagline, updated contact information, and of course, your website. Consider adding a USB element to keep the lines of communication going after you’ve handed off the card, and give people access to even more information so they can get to know your brand. The business card is a wise marketing investment. It may even be the smartest one you’ll make. Purchasing business cards is far less expensive than many other marketing materials; while the payback of putting a physical remembrance in prospects hands is big. 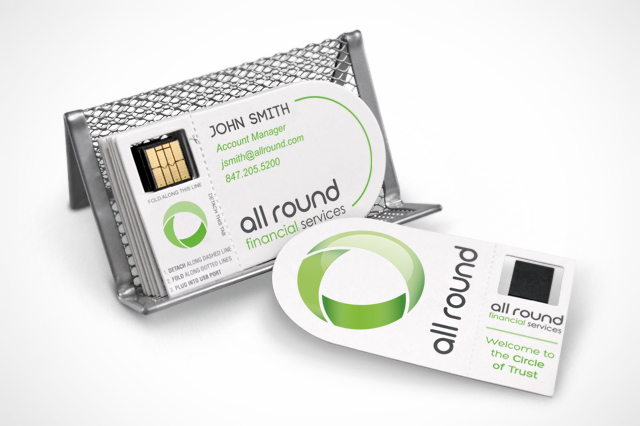 Make your investment a savvy one, and consider alternative options like a Smart Business Card™ with an innovative design and a catchy image or logo. please can you send me a quote for 500 business card USB’s?